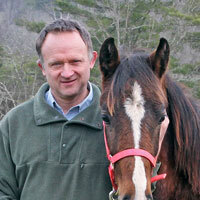 Company > Team > Robert Sinclair, Ph.D.
Bob has managed Haw Creek Animal Hospital in Asheville, North Carolina, since 2005. He received a Bachelors degree in Genetics from Queen Mary College at the University of London and a Ph.D. in Molecular Biology from the John Innes Institute at the University of East Anglia. His prior research career included developing DNA sequencing instruments and a decade-long foray in computational biology with Mouse Genome Informatics at The Jackson Laboratory. He shares Heather's passion for animal welfare, caring for dogs, cats, parrots, and horses at their home and land. Bob is EquiSeq's Molecular Biologist. In his work for EquiSeq, he has carried out a broad range of activities, including sample collection and DNA isolation, the development of PCR assays, and bioinformatics. You'd be surprised to learn that ... Bob's current horse is Rio, a 6 month old Tennessee Walking Horse mix who was rescued from the slaughter pen at the local horse auction.